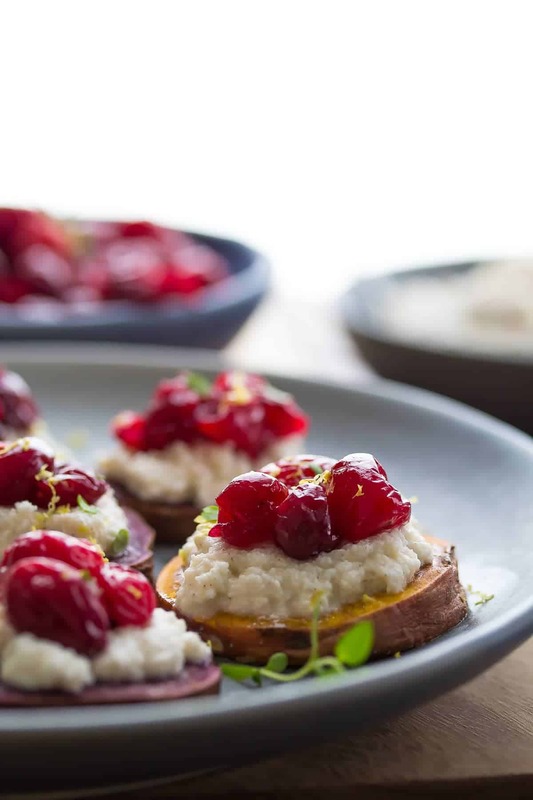 An easy holiday appetizer recipe: sweet potato crostinis, topped with spiced ricotta and cranberries. A perfect, healthier option. Today is Black Friday. Which means it’s almost December. Wow. Cray-zee. No idea how that happened! So today will most likely signify the shift on the internet to all things Christmassy. Are you ready for it? It’s happening. Peppermint everything. Eggnog EVERYTHING. Brace yourselves. And because I like to do what all the cool kids do, I jumped on that holiday bandwagon and I have a holiday appetizer recipe for you! Not just *any* holiday appetizer, but a healthy holiday appetizer. Ever since my mom told me how hard it is to find good healthy party appetizers, I’ve been on a little mission. Earlier this year I made these Bruschetta and Goat Cheese Stuffed Mushroom Caps, and these Zucchini Caprese Roll-Ups. I have been obsessed with the idea of using sweet potato rounds as a base for a crostini for awhile…I think it’s been on my ‘to do’ list since the summer! And they were worth waiting for. I decided to top these roasted sweet potato rounds with some spiced ricotta…ricotta with a little bit of nutmeg and cinnamon stirred in. The spiced ricotta gives a bit of creaminess to everything with a hint of those wintery spices. Then, I topped the ricotta with some roasted cranberries and fresh lemon zest. 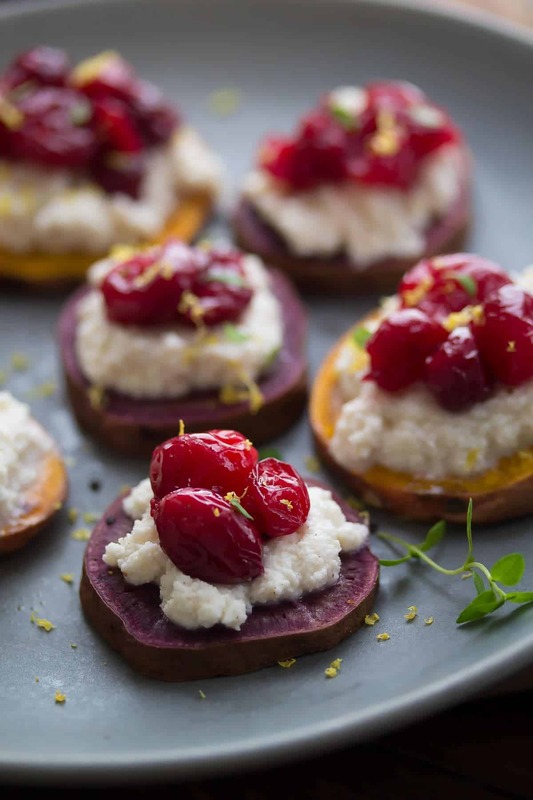 The cranberries add the PIZZAZZ to these lil’ sweet potato crostinis. Now the ricotta doesn’t add a ton of flavor to the dish, just a nice, mellow creaminess. If you are looking for something really tangy, I’d recommend some cream cheese, or even goat cheese would be great. Or brie…oh gosh brie would be amazing!! Basically these guys are very versatile and would work great with any number of cheeses. These sweet potato crostinis can be made ahead of time…however with the ricotta, I don’t recommend assembling them ahead of time as the ricotta can seep some liquid. It would probably be better to serve a platter of the roasted sweet potatoes with a bowl of the cheese and cranberry toppings and let your guests assemble them. I love these appetizers because they are so good for you! Sweet potatoes and cranberries are both superfoods, so you are getting a bit of nutrition while you snack. 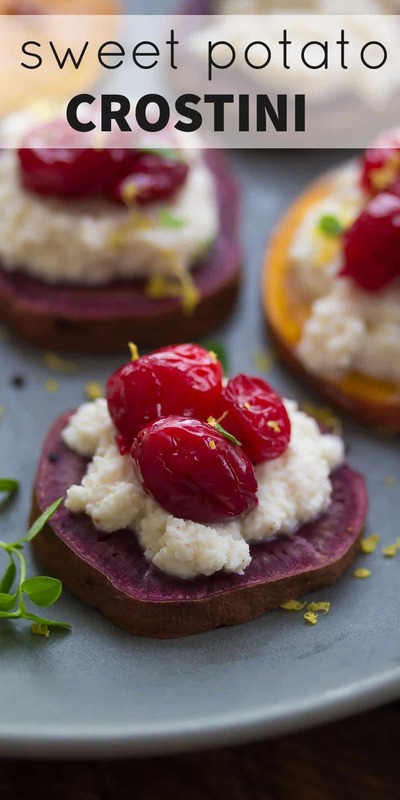 Sweet Potato Crostinis with Spiced Ricotta and Roasted Cranberries are up on the blog today! A healthy holiday appetizer that is packed full of superfoods and can be made ahead of time. Toss the sweet potatoes with the olive oil. Arrange on cookie sheets. Sprinkle with salt and pepper. After 15 minutes of cooking, turn the sweet potato rounds over and return to the oven, along with the cranberries. Cook for another 10-15 minutes, until sweet potatoes are cooked through (this will depend on how big they are, mine were ready after 10 minutes) and cranberries are soft (for frozen cranberries you will probably need at least another 5 minutes). While they are cooking, stir together the ricotta with the nutmeg, cinnamon and salt. These appetizers can be made the day ahead with each component stored separately. Just prior to serving, crisp up the sweet potatoes for 10 or so minutes in a 350°F oven! Denise, these look amazing!! We all need more healthy app`s, especially this time of year!! Love your site!! Hi Tez! Thank-you so much! Healthy apps seem so hard to come by! Oh my what a great idea! So many delicious flavors in these little crustiness and I love how you used sweet potato as the base! No doubt, a perfect appetizer for this time of year. I’m just rediscovering ricotta and all the delicious ways it can be enjoyed. Thank you for this creative recipe my dear! Thanks so much, Traci! I rarely use ricotta, but it’s so creamy! I need to use it more often. Denise, these are so up my alley! I love sweet potatoes, and I love the sound of the roasted cranberries with ricotta. I actually like how mellow ricotta is, and wouldn’t change a thing about these! I like it too…it’s just kind of creamy and a blank canvas for all of the other flavors. Thanks, Marcie! These look so good, I’ll just have them for the appetizer AND the meal. I love the addition of thyme to the cranberry sauce. I saw the roasted cranberries and my heart skipped a beat. I would love these and they’re beautiful to look at too! Thank-you so much, Maureen! I absolutely had to buy those purple sweet potatoes when I saw them…too pretty! Yep, it’s time to move on from Thanksgiving side dishes towards all things Christmas! I’m definitely on the search for healthier appetizer recipes, and these crostini look like a perfect combination of flavors! 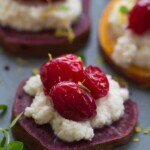 That spiced ricotta sounds wonderful! Thanks, Kristine! I have been making SO many appetizers already this month…I could eat them for dinner!